Defying all odds, Bangladesh’s centre-right opposition party, Bangladesh Nationalist Party, has just clinched a deal with Kamal Hossain, an 82-year-old secular icon, raising its hope to end the ruling Awami League’s decade-long rule. Dhaka: How much would you bet on a party that has been out of power for more than a decade, its chief behind bars on corruption charges and its exiled de facto leader just sentenced to life in a case over a deadly bomb blast? Not much, I assume. But, defying all odds, Bangladesh’s centre-right opposition party, Bangladesh Nationalist Party (BNP), has just clinched a deal with Kamal Hossain, an 82-year-old secular icon, raising its hope to end the ruling Awami League’s decade-long rule. Kamal Hossain, famously known as Dr. Kamal, has an impeccable reputation as an internationally acclaimed jurist and human rights defender. He served as a UN Special Rapporteur for Afghanistan from 1999 to 2003 in addition to serving as a member of numerous international arbitration tribunals. A former Oxford University professor, he has also been an important part of the country’s contemporary political history, making him one of the most familiar faces in Bangladesh’s politics. He was a close ally of Sheikh Mujibur Rahman, the country’s Independence leader, from the pre-Independence period until his brutal murder in 1975. He was the country’s first law minister and the chief of the constitution drafting committee. He then went on to serve as the country’s foreign minister. He played an instrumental role in bringing Sheikh Hasina, Rahman’s daughter and the current prime minister, to Bangladesh from her exile in India in the ‘80s, to mount a political challenge to the rule of General Ziaur Rahman, BNP’s founder. Now, with politics true to its form, he’s now seeking to end her rule by winning the forthcoming election after forging an alliance with the BNP. Hossain formed a new party in the early ‘90s, having fallen out with Hasina. Since then, he has worked on human rights issues. During the centre-right BNP’s 2001-2006 tenure, he was one of its fiercest critics. He was particularly vocal about the then government’s failure to protect minorities. What’s more, the heavyweight lawyer almost singlehandedly destroyed BNP’s ploy to manipulate voter list in its favour. Also read: What Can Tulip Siddiq Do to Lessen Human Rights Abuse in Bangladesh? In recent years, especially after Sheikh Hasina’s unopposed return to power in an election boycotted by the oppositions, an ailing Hossain has been concerned by what many say the government’s drift towards authoritarianism. End of the Zia dynasty? Khaleda Zia’s son and political heir, Tarique Rahman, has acted as de facto leader of the party from his exile in London. However, he, too, has been sentenced to life in absentia in a case over a deadly bomb blast dating back to 2004, when BNP was in power, targeting a rally of the then-opposition party, AL. The blast, known as August 21 attack, killed 24 killed, while leaving hundreds, including Sheikh Hasina, injured. BNP maintains that the charge against Tarique Rahman was politically motivated and that the judiciary remains at the behest of the government. They cite the case of former chief justice Surendra Kumar Sinha, who was forced to resign last year, to claim how the government controls the judiciary. His lawyers argue that the centrepiece of the verdict was a revised confessional statement given by Mufti Hannan, the leader of Harkat-ul-Jihad (HuJI) – which was said to have carried out the attack, incriminating several BNP leaders. They point out that Mufti Hannan, who was executed in April last year in another case, later applied to withdraw his statement saying he had been coerced into signing it. By any means, it was a severe blow for a party trying to mount a challenge against a government which has solidly entrenched itself in the system over the course of its back-to-back tenures. In any other circumstances, a life sentence for the only heir-apparent of a political dynasty might spell its demise. But, the BNP has bounced back instead of crumbling. Tarique, from his safe exile in Britain, does not seem to be struggling to maintain his grip over the party. The ‘elders’ of the party, who once resented his lead, seem to have grudgingly accepted him and defended him – vigorously that too, at a time when the moral legitimacy of his leadership is being questioned. 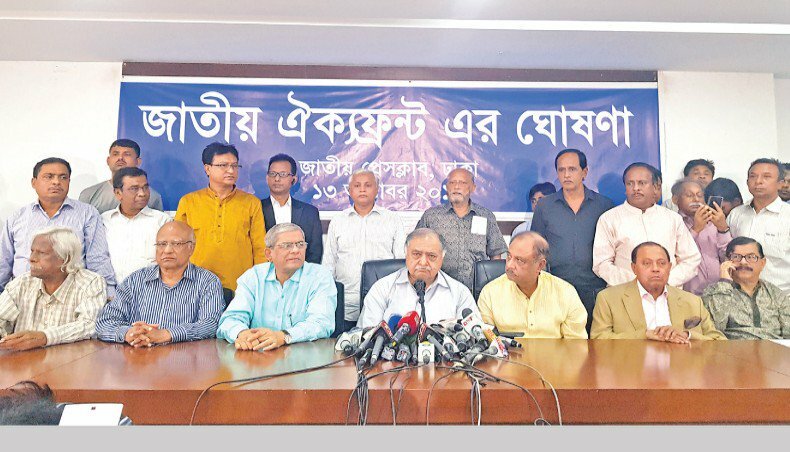 What’s more, just days after the judgement, which was expected to be a major setback for the party, BNP has just forged an alliance, National Unity Process, with parties and groups belonging to different aisles of the political spectrum. But such defiance was unsurprising. After all, BNP has survived many rumoured attempts to divide the party with hundreds of thousands of its activists targeted by police. Moreover, it had 14 years to prepare itself for this verdict which it saw coming miles away. Even so, the BNP has paid an inevitable political price by accepting Kamal Hossain as the leader of the alliance as Khaleda and Tarique are highly unlikely to be able to contest in the election. It means, for the first time since Khaleda took the helm of the party in the early ‘90s, it may be going to polls under the leadership of someone else. With BNP put on the back foot in the wake up of the August 21 verdict, its potential partners – mainly small parties with almost no political prowess – are trying to assert greater political leverage because they know the ruling coalition, too, is looking to expand itself. Bikalpa Dhara, a small but important party led by former president Badruddoza Chowdhury, another political heavyweight who had left BNP in 2006 after a bitter episode, has already parted ways with the unity process. The party was known to have been at loggerheads over the BNP’s separate ties with Jamaat-e-Islami and seat sharing. Another party, Krishak Shramik Janta League, led by Kader Siddique, an independence war hero, which was until recently informally allied with BNP, is rumoured to be cosying up with the ruling party. Known left-leaning parties, such as the Communist Party (CPB) and Socialist Party (BaSAD), while opposing Hasina’s rule, have not consented to be a part of the BNP-led alliance. Therefore, the new political platform, National Unity Process, may come short of being a unified opposition alliance, as its founders are hoping it to be. Nazmul Ahasan is a Bangladeshi journalist.